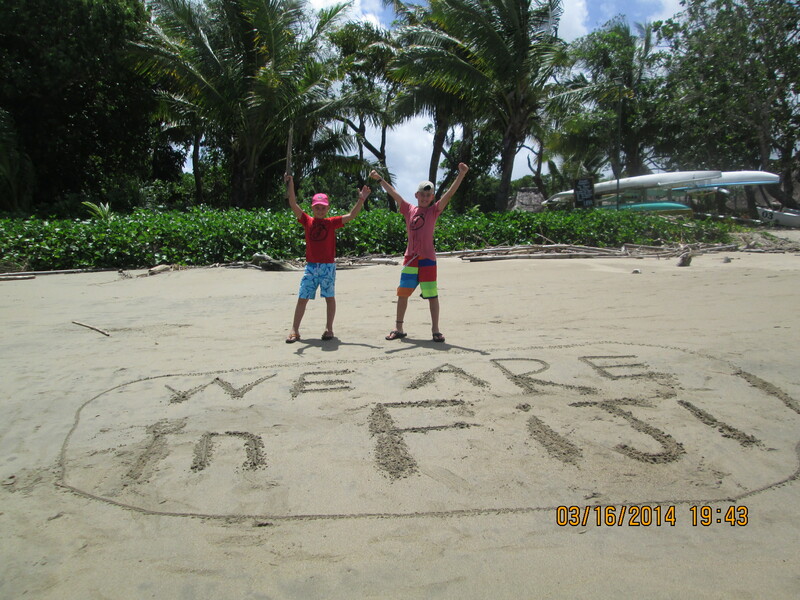 BULA!….And then there we were; on one of the 333 Fijian islands in the middle of the Pacific Ocean! 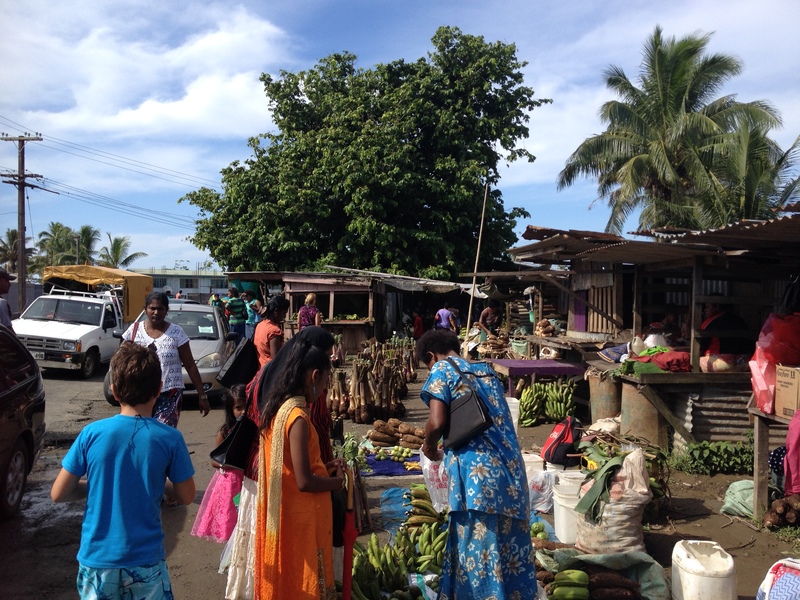 We landed in Nadi (located on Fiji’s main Island; Viti Levu) and moved to our hostel for the night – where it was very hot and dark (the power had gone off due to a recent storm – and apparently a cyclone was on its way!). Although it was late, we all jumped into the pool at the BlueWater Lodge (http://www.tripadvisor.com.au/Hotel_Review-g294335-d1027278-Reviews-Bluewater_Lodge-Nadi_Viti_Levu.html, where one of the staff members had great fun entertaining the kids with silly water games. After a pretty bad sleep (Filou was so hot, he slept on the stone-cold floor and I was hoping all night that Anthony and Emile would not fall out of the very, shaky bunk bed – especially as my hubby was passionately chasing the many mosquitos in our room that were attacking us), we quickly moved on. A local bus took us from Nadi to Suva – at the other end of the island (about 3 hour drive) – where we landed in the Pacific Harbour area. It was here that we stayed at the most idyllic and wonderful place; Nanette’s B&B (http://www.nanettes.com.fj. This amazing guesthouse, owned by Australian Nanette – was run by two of the most hospitable Fijian ladies named Seria and Saras. 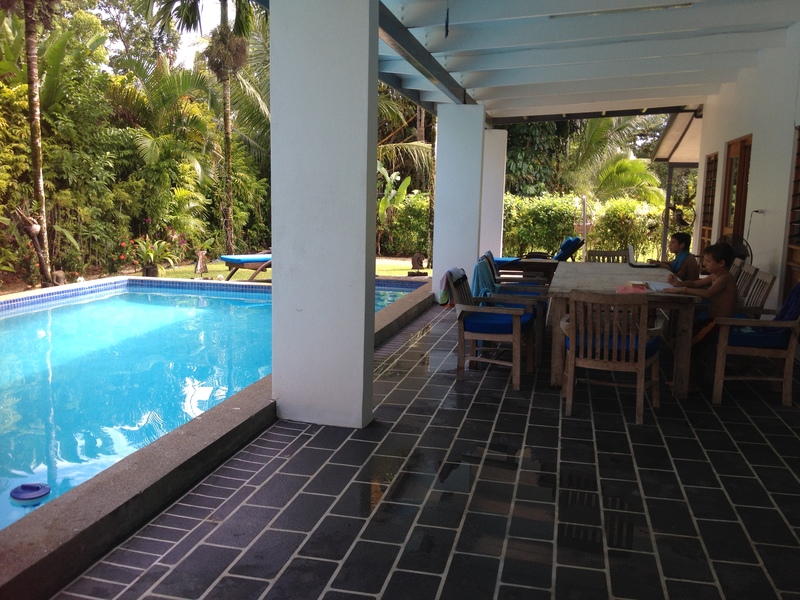 We were extremely lucky to have the gorgeous, bright and spacious house with large swimming pool all to ourselves as there where no other guests for the week we were there. It was just what we needed after a period of fast travel! On our first afternoon in Pacific Harbour, we walked to the grocery store when we encountered a 60-year old, Japanese man feverishly cutting leaves from his property. He looked up, put his large machete knife down for a moment, and took a break to talk to us. We instantly took a liking to this man who was really funny (he admitted he was a little drunk from drinking a few beers at the golf course that afternoon). He loved that we were Watanabe’s and invited us onto his large piece of land to come and taste the milk of some young coconuts (which he said would make us 1 year younger). It was delicious! Taro was delighted that the kids liked his “magic potion” and when he learned that they also enjoy Japanese food, he said that for $10 a person, he would make us a Japanese meal that when finished, we would want to pay more for! We tried to laugh things off and push the dinner to a later date (as we weren’t sure if a meal from this slightly drunk man would actually materialize), but he kept insisting that tonight was the night. So, after inspecting his home – which looked slightly messy but nice enough, we agreed. He asked us to pick up a few things at the store and return in one hour. When we came back, he had showered and dressed into a traditional Japanese outfit. He had cleaned his home, had put fresh flowers from his garden on the table and had put on some lovely French tunes. Filou told him he wanted to eat oyakodon (chicken & egg over rice dish) and we informed him that we would be pleased with some sushi. For the next 2 hours, Taro became totally focused, and under the watch-full eye of the children, who loved helping him, turned into a Master Chef. He cooked us a meal that can only be described as 5 star -deluxe….It was truly scrumptious and even more tasty as it was such an unexpected surprise! 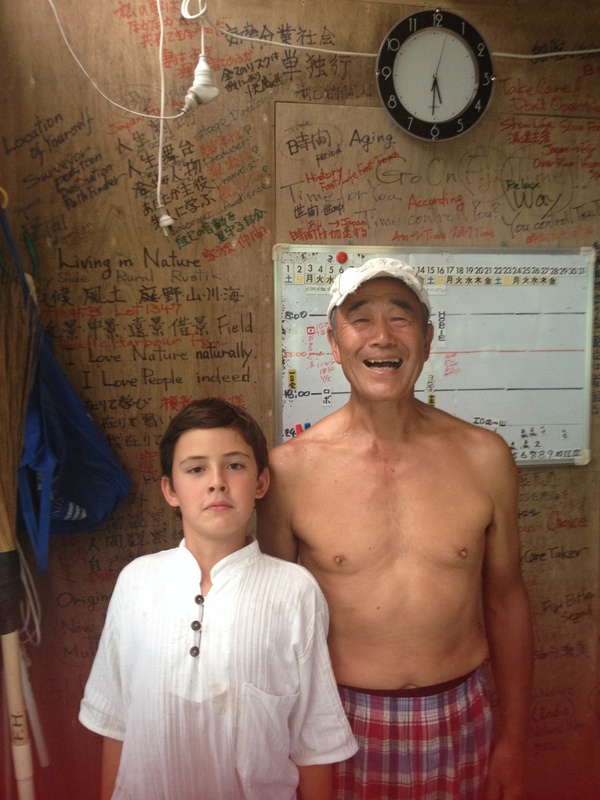 We learned that Taro had been a civil engineer in Japan and had lived in Fiji for the past 14 years. 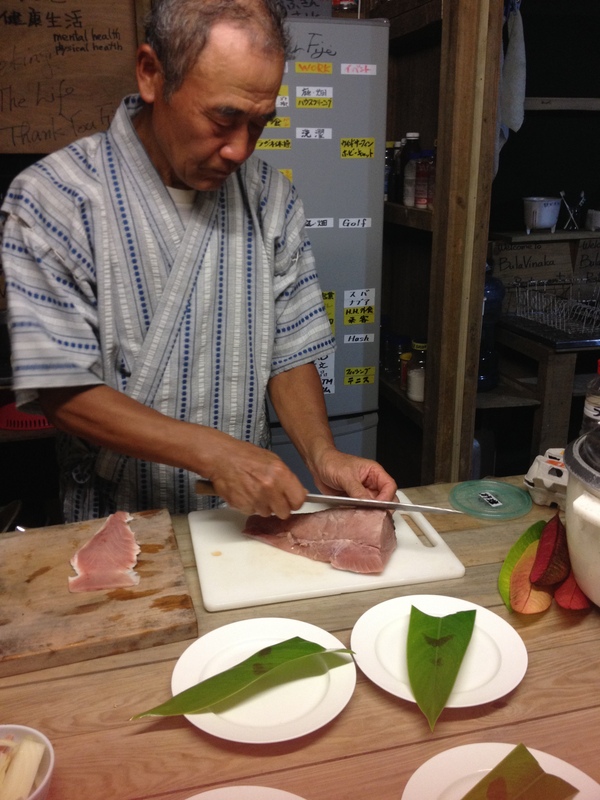 During his retirement, he now loved to work his land, play the occasional game of golf and cook (he said that his wife was more interested in the grandkids then him, so she travelled back and forth between Japan and Fiji every 3 months). He showed us around his self-built house out of plywood – one that was extremely smartly designed with special water drainage features, multi-purpose sliding doors etc. – all with a Japanese touch. This very smart, slightly eccentric man showed us two of his walls which where full of English & Japanese writings (in red and black marker) – sayings and opinions about life, cooking, politics – all his doing. It was really neat! After a lovely chat and many thank-you’s for the amazing meal we said our good-bye’s…with the realization that it is these kinds of encounters that make our trip so very fulfilling. What we learned in the coming days was that The Republic of Fiji comprises of 333 islands of which only 110 are inhabited. 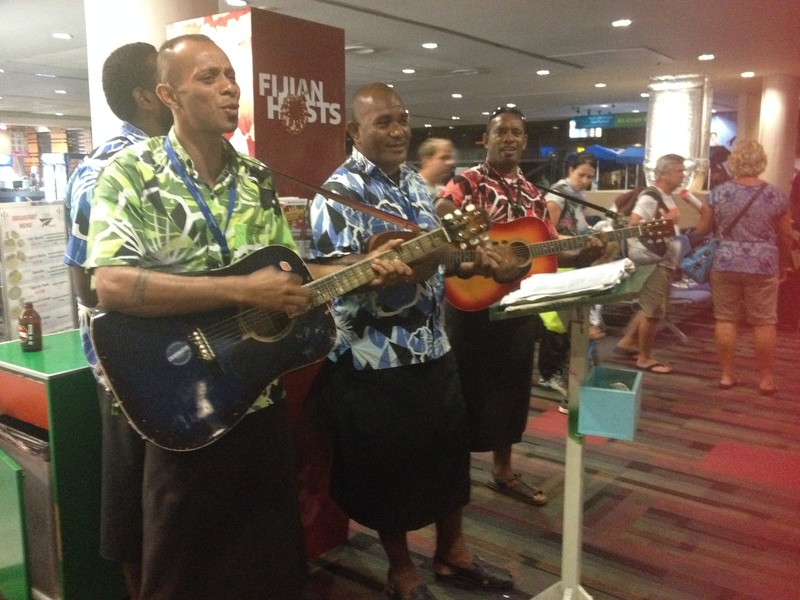 The total land area of Fiji is about 18,300 square kilometers (or 7,100 square miles) and Viti Levu or Great Fiji is the largest and most populated island with almost 70% of all Fiji inhabitants. Our location, The Pacific Harbour area, has the reputation of being Fiji’s adventure capital, offering a wide variety of activities to get hearts racing. 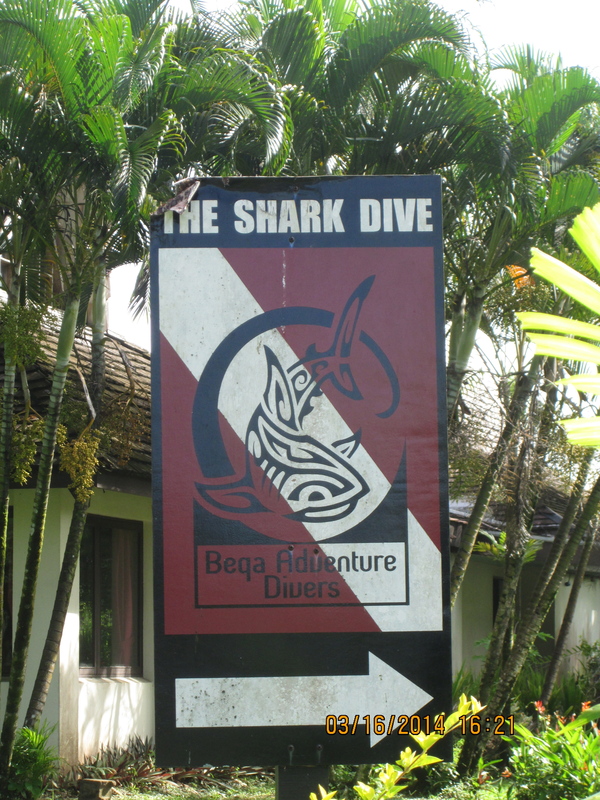 The area is famous for its Shark Reef where adrenaline junkies go free diving (no cage!) and can see (and feed) up to 8 different species of sharks in one dive – including encounters with bull sharks and tiger sharks. Although this all seemed very appealing, we decided to stay safely on land! The population of Fiji is mostly made up of native Fijians (54.3%), and Indo-Fijans (38.1%), descendants of Indian contract labourers brought to the islands by the British colonial powers in the 19th. century. Saras, of Indian descent, was kind enough to cook us a traditional chicken & pumpkin curry, complete with freshly made rotis. So very tasty! 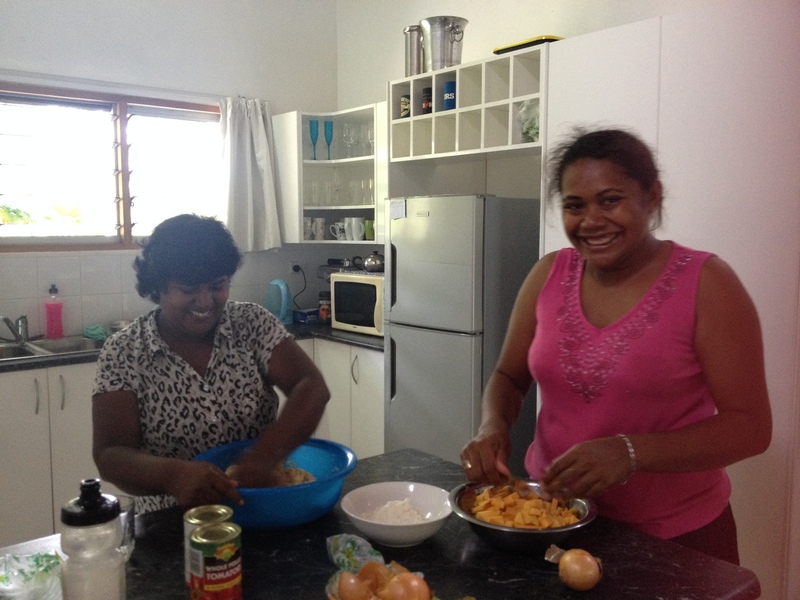 And Emile spent a wonderful afternoon in the kitchen with Seria who taught him how to make Fish Lolo; a Fijian style fish in coconut-tomato sauce with Aibika (green, leafy vegetables). We took a local bus to the nearest market, where we purchased two very large parrot fish (total $10) for this traditional Fijian dish. 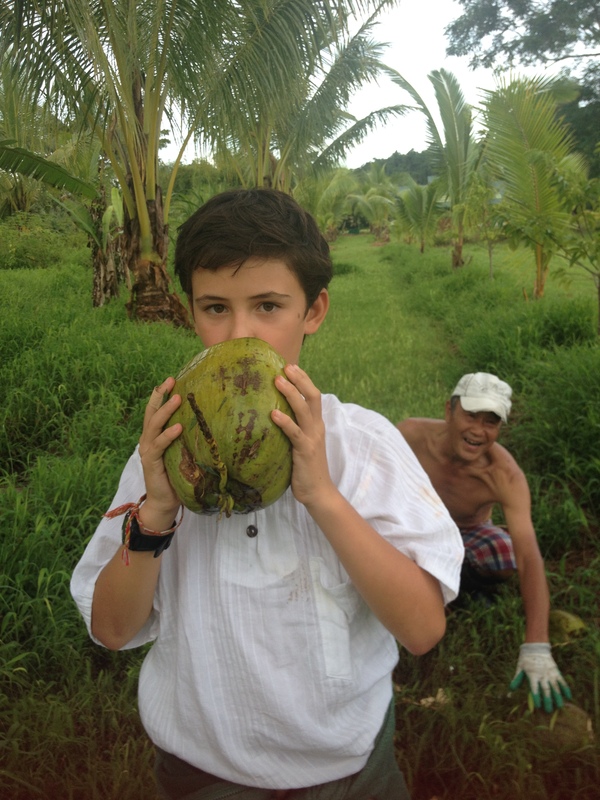 The coconuts, taken from Nannette’s garden, where cut open and scraped by Emile, with a special tool. He then took the coconut flesh and hand-squeezed it into milk (this yummy fresh juice was definitely the secret ingredient). 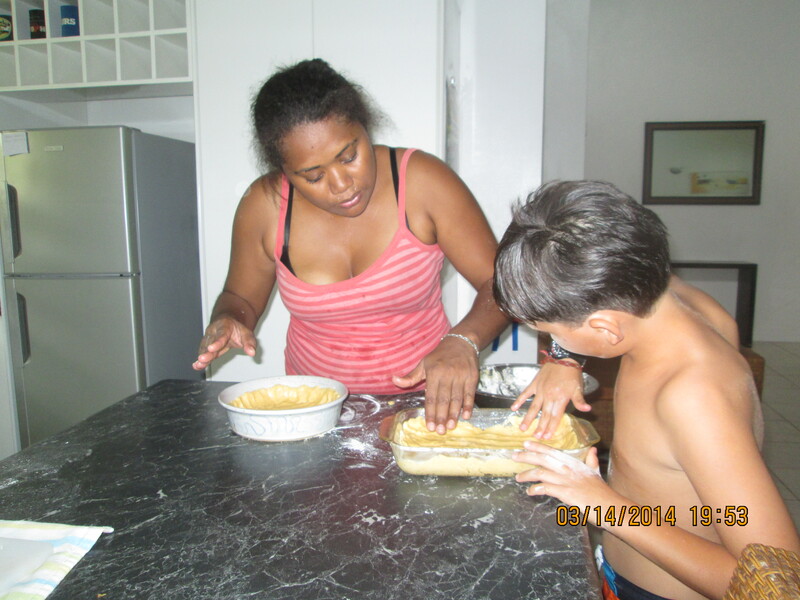 Last but not least, Emile mastered to make a delicious pumpkin pie with lemony topping. He loved his time with Seria in the kitchen and we were all happy to taste his delicious creations! Besides chefs and musicians (Filou spent several afternoons, enthusiastically practicing his music with Papa), we also seem to have builders in the family! 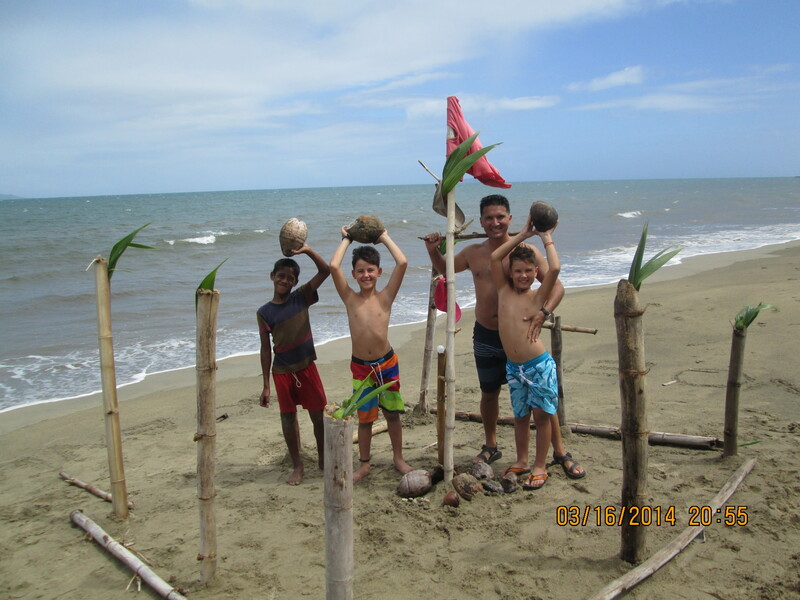 Our beautiful, nearby beach was filled with large bamboo logs, twigs, leaves and other fun items that inspired the Watanabe boys to build a fort. With the help of a sweet, local boy named Tanuk – they crafted what they called was “the best creation out of natural materials they ever made”. Complete with artillery (bamboo logs), bombs (coconut shells), a victory flag (Emile’s pink t-shirt with a lizard on it), a bell & a light…the fort was a masterpiece. They even gave it a name (EFTAL – Emile, Filou, Tanuk, Anthony, Lizard) and made a victory song. What an amazing afternoon; seeing boys being boys, and creativity flowing in abundance! After some super relaxing days, we said good-bye to the men in sulus (a type of skirt, traditionally worn and regarded as the country’s national dress), the beautiful countryside, the refreshing pool at Nanette’s and the warm Fijian people. It was definitely Seria, with her inviting smile and wonderful hospitality that made our stay in Fiji one to remember! And now we are flying back to the Americas where we are excited to reunite with YiaYia and Nuno in Los Angeles.